Members of the film collective The Black Aesthetic: (back row, left to right) Jamal Batts, Leila Weefur, Ryanaustin Dennis; (front row) Zoé Samudzi, Malika “Ra” Imhotep. They organize screenings, moderate discussions, and publish books. About 100 people crammed inside UC Berkeley Art Museum and Pacific Film Archive's tiny reading room one evening last November. As soon as it felt like no one else could possibly fit, a few more folks would lurk in the hallway, craning their necks to see what cool, inspiring night The Black Aesthetic had in store. More white folding chairs emerged. More delicate steps over bodies ensued. It was The Black Aesthetic's season three finale and the film screening collective's most well-attended event yet. 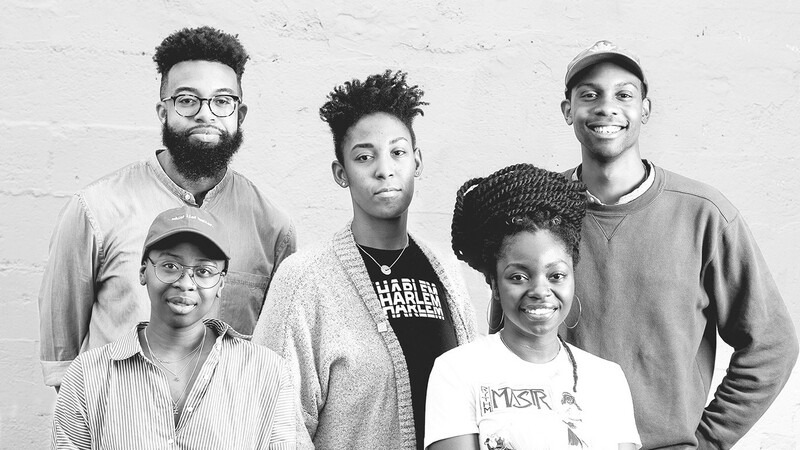 The five-person team formed in late 2016 with the goal of showcasing the multidimensionality of Blackness in under appreciated films or works by emerging filmmakers. On this particular evening, one of The Black Aesthetic's original founders showed his short film A Moment of Truth + Sin, a dark thriller about a Black man who fantasizes about killing his progressive white wife — Oakland filmmaker Christian Johnson's spit in the face of the Bay Area's suffocating white liberalism. Despite the piece's intensity, the resulting panel discussion bloomed with laughter. Johnson and collective member Malika "Ra" Imhotep deftly navigated both racially charged realities and motivations behind Johnson's creative decisions without any film school jargon. It's not surprising that The Black Aesthetic has become something of a media darling. These events capture Black joy at a time when it'd be far too easy to be beleaguered. Looking back on 2017, it felt like a significant year for Black arts in Oakland and the rest of the inner East Bay. Countless events explored Black identity in different ways: visual art exhibits, one-off dance classes, and full-blown festivals celebrating Black culture, plus new books, magazines, podcasts, and films. Of course, the city has long been a bastion for Black culture, activism, and life. But what's happening now feels particularly informed by the region's declining Black population coupled with the housing crisis. In turn, much of the art reflects an increasing urgency to preserve the local legacy of Black culture, to hold space, and to explore questions of belonging. During the Great Recession, the Black arts scene stagnated — and with fair reason. Who is going to start a new arts organization when many people are struggling to feed their families? The Black Aesthetic's Leila Weefur witnessed this first-hand. Born and raised in Oakland, she left in 2007 to attend college in Washington, D.C. and Los Angeles and returned in 2012 as a graduate student at Mills College to find her community had already vanished. "Oakland was the hub of Black art when I was growing up, but leaving and coming back and that being gone was devastating," she said. "I think right now, there is an increase in Black creatives making space for themselves because it's missing." As Black folks continue to get priced out of Oakland and the inner East Bay, Black artists are affirming their presence through these events. At the same time, higher rents and costs of living are making it challenging for artists to continue their work — especially with the knowledge that they could earn more money in a less expensive region. The Black Aesthetic, most of whose members are graduate students scraping by, doesn't make any money for its efforts. They organize film screenings, moderate discussions, and publish books, but they won't turn anyone away who can't afford the $5 ticket. They believe in accessibility. At the same time, given that they donate their own limited funds to The Black Aesthetic's needs, members like Zoé Samudzi aren't sure how much longer they can keep it up. "Nobody wants to pay Black people to live, to eat, to make the things that they want see, to put on Instagram and be like, 'Look at this cool thing that I went to,'" Samudzi said. "Everybody wants to consume Blackness but nobody wants to make sure we don't die." The history of Black culture in Oakland runs deep. In the 1940s and 1950s, Oakland had a vibrant entertainment district nicknamed "the Harlem of the West." In 1966, the Black Panther Party was born, becoming hugely influential for its activism as well as the bold artwork that would grace its popular newspaper. Soon after, Oakland had an African-American artists' advocacy group, Art West Associated North, that protested the exclusion of Black artists from local galleries and museums. All of this helped shape a city that would become half Black by the '80s, a place well-known for art with a political bent. By 2000, the city's Black population started declining. Black folks made up 35.1 percent, down from 43.9 percent a decade earlier. By 2010, it had dropped to 27.3 percent, and according to 2016 Census estimates, that figure has further dipped to 24.1 percent. And the city's white population has been climbing. For the first time since 1970, white people were estimated to become the dominant racial or ethnic group in Oakland in 2014 at 26.5 percent. The current exodus of Black folks stems from the Bay Area's housing crisis. Rents have doubled and sometimes tripled in places such as West Oakland, a historically Black neighborhood that's now popular with white tech workers who have fled San Francisco's even higher prices. Deep East Oakland native Brittani Sensabaugh lives with her mom in North Oakland on a block that used to include a few fellow Black families. Now, there are no more.